The Theory of Everything (2014) is the story of Stephen Hawking’s (Eddie Redmayne) relationship with his first wife, Jane Wilde (Felicity Jones). The movie begins with a blissfully active scene featuring a smiling Hawking, racing bikes on the way to a mixer at Cambridge. A man I considered a mentor was struck by ALS and literally over the course of a few months he went from a vibrant soul running into the office with a story of some strange thing that happened to only being able to move one finger. To think of Dr. Hawking as the once vibrant figure will be a stretch for many modern viewers and the joy with which the writers imbue and Redmayne acts him is just a testament to a strong spirit that became trapped in a body no longer willing to cooperate. We see the stumbles and the hints that something isn’t right, but while we know the outcome, we see Hawking writing them off as inconsequential. Jane spots Hawking across the room at the party in the opening scene and there’s instant attraction, though her friend thinks he’s incredibly odd for his participation in protests. A Ph.D. student, the immediate concern of Hawking’s friends and Professor Dennis Sciama (David Thewlis) is the topic of his thesis. When Sciama takes Hawking to a lecture about black holes, his path becomes clear. As Hawking works on his thesis, he takes a fall and when the doctor reveals that he has Motor Neuron Disease (then already known as Lou Gehrig’s Disease), the mind is Hawking’s first concern and not the life expectancy of two years. The doctor assures him that his mind will remain the same. The Theory of Everything is as much about Hawking’s disease as it is about his relationship, and the deterioration thereof, with Jane. The Theory of Everything is a beautiful movie. From the massively ornate architecture to the gorgeous 1960s fashions, it is a subtle movie connected to another time where eras are fluid. The actors play a couple falling in love while around them the music characterizes their path to a connection that is cerebral. The acting of all players in the piece rank in the outstanding range. Redmayne won an Oscar for best actor for his portrayal of the late physicist. Jones’s depiction of an idealistic young woman determined to be everything for the man she loves was both poignant and heartbreaking. I have read, viewed and reviewed some of Hawking’s work but to see The Theory of Everything put a new spin on the late genius. I have literally no criticism for this film. It was one that, until making a list for Towel Day, I hadn’t considered viewing but am glad I did. While I understand the movie is highly fictionalized, the spirit rang true to its subject who lived for many years beyond the projected two years passing away earlier this year at the age of 76. 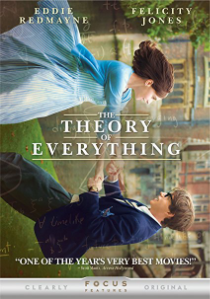 The Theory of Everything is available as a DVD, Blu-ray and on Amazon Instant Video.